Much of our work arises from referrals and recommendations from satisfied customers. Our plumbers and heating engineers are Gas Safe™ registered and are trained to deal with even the most challenging of situations. With our wealth of knowledge and experience in the industry, you can rest assured that our technicians will carry out jobs swiftly, cost-effectively and to a first-class standard. 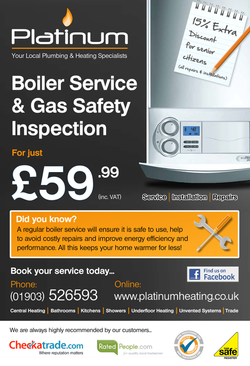 Have you used Platinum Plumbing & Heating Specialists?